I love Bradley. There, I said it. Look at him, all grown up and posting in our blog! Tears to my eyes, seriously. Brad makes me laugh. Constantly. That was one very high requirement on the man I marry, one who could produce much laughter. He certainly fits the bill. He even managed to have me laughing the way he proposed. He's a keeper! One of the funniest things that he's ever done involves one thing that I am very much obsessed with: Harry Potter. I LOVE Harry Potter. I have read those books, listened to those books, and seen those movies many-a-times, too many to count. Brad knows this. He bought the DVD box set for me for our first Christmas and has been forced to re-watch those movies more times than he probably has ever wanted to. But he does it, because he's awesome. That's not the awesome thing he did, however. I mean, that's awesome, but he did something even more awesome. One morning, probably a year ago from right about now, I was heading off to work. I had already said my goodbye and "I love you" to Brad, and I was sitting in the car waiting for it to warm up before I pulled out. I suddenly hear this knock on my driver's side window, and there's my husband. I wave and am about to roll down the window to see what he needed, when he suddenly breathes a thick layer of condensation onto the window. In it, Brad writes, "B + H" in a heart, and then proceeds to breathe another fog onto it to make it stand out. At this point, I just bust out laughing. 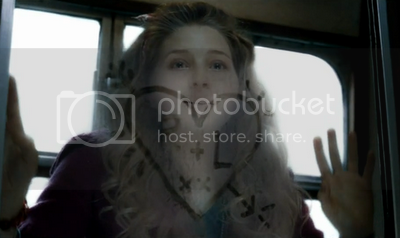 If you don't know, Brad had reenacted a scene from the sixth Harry Potter movie, wherein Lavender Brown draws her and Ron's initials on their compartment's door on the train ride home for Christmas holiday. I laughed the whole way to work that day.